Say Thank You on Thanksgiving! It’s easy to lose sight of the things that are important. We can easily be consumed by the things we want and don’t have. Left unchecked, this could lead to a life of unhappiness. Thanksgiving is upon us and I want to pause and reflect on the things that I am thankful for. I am thankful for my family and friends. They are very supportive of me. I am also thankful for the good fortune that I have in my life. Sure we have our ups and downs but it’s important to remember the good that we have in our lives. Many people have less than we do! As my blog turns two this year, I want to thank my followers on this blog and social media as a whole for all of the support they have given me. Your support has been invaluable to me. You have enriched my life in so many ways. 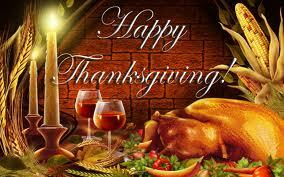 Remember to say thank you on Thanksgiving and count your blessings. This entry was posted in marketing and tagged thank you, Thanksgiving. Bookmark the permalink.